The PDS-6000 High-Speed Desktop Scanner offers powerful features for medium to large-size businesses and offices with demanding scanning requirements. 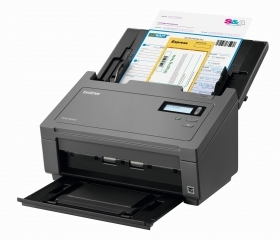 Using the generous 100-page capacity auto document feeder, this scanner is able to capture single and double-sided documents in a single pass at speeds of up to 80ppm‡, making it perfect for scanning multi-page, two-sided business documents, as well as single-page documents up to 236" long‡, business cards, and embossed plastic cards‡. Easily scan to a range of destinations, such as file, OCR, email, FTP, network folders, and Microsoft® SharePoint®, in a wide variety of file formats including PDF, TIFF, JPEG, as well as Microsoft® Office formats‡. The SuperSpeed USB 3.0 interface also enables rapid processing of scanned images to help maximize your business's productivity. The PDS-6000 boasts various integrated image optimization features, including ultrasonic multi-feed detection, background removal, blank page removal and deskew support. It also features batch barcode support for scan job separation, to help simplify file sorting and searching. Plus, the PDS-6000 is compatible with Kofax VRS®‡. An industry leader in image processing software, Kofax VRS® dynamically evaluates each scanned page and automatically applies the correct image quality settings for maximum output enhancement, making the PDS-6000 the complete high-volume scanning package for your mid to large-size business.